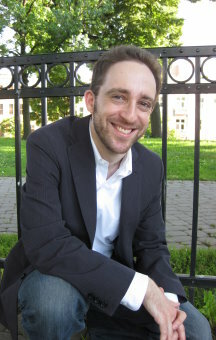 Judah E. Adashi is the child of Israeli parents, but was born (in 1975) and raised in the United States. He teaches composition at the Peabody Institute of the Johns Hopkins University in Baltimore, where he is also founder and director of the Evolution Contemporary Music Series. He studied with Nicholas Maw and John Harbison. He has been honored with awards, grants and commissions from the American Academy of Arts and Letters, the ASCAP and BMI Foundations, Meet the Composer, the American Composers Forum and the Aspen Music Festival, as well as three residencies at the Yaddo artist colony. He holds degrees from Yale University and the Peabody Institute of the Johns Hopkins University. The fictional town of Macondo is the setting of Gabriel García Márquez' One Hundred Years of Solitude. This suite for woodwind quintet (here imagined as a band of street musicians) was conceived as a songbook of sorts, inspired by musical elements and episodes in the novel. For the most part, these songs and dances employ a shared melodic and rhythmic vocabulary; each develops through harmonic and timbral modulations, while collectively, their chronological sequence loosely traverses a broader narrative thread. Songs and Dances of Macondo was commissioned by the Aspen Music Festival. The piece was recognized with first prize in the 2005 Prix d'Été competition at the Peabody Institute of the Johns Hopkins University, and a 2005 ASCAP Foundation Morton Gould Young Composer Award. The internet is a great thing. I was going from link to link searching for new repertoire ideas and researching composers when I came upon Judah Adashi and found he had written a work, "Songs and Dances of Macondo" based on award winning Colombian author Gabriel Garcia Marquez' "One Hundred Years of Solitude". I thought "What a perfect piece for a group that was founded in Colombia!." I hoped the piece would turn out to be good. I went right away to Judah's sound samples and was delighted to discover an excellent piece. We are featuring this work on many of our concerts this season. Most of the performances will include readings from the novel which relate directly to movements of the piece.